Iï¿½m worried. Itï¿½s July 2010, winter in Brazil and 75 degrees. ï¿½This is itï¿½, I thought as I laid with my head against the brick wall. Only 30 minutes until they start calling my bracket to compete. Rodrigo is in front of me standing guard with his back to me as if to shield any person or thought from reaching me. Birds are flying overhead because we are in an open air stadium in Brazil. Itï¿½s covered, but there are no windows, just slits in the concrete about 4 inches wide. Itï¿½s over. Nothing else to worry about. I would either win it or I wonï¿½t. Iï¿½d flown to Brazil to compete in the World Championships. Nobody wants to travel that far and not win at least 1 match. I know if I win the whole tournament, Rodrigo is certain to give me my black belt. If I lose, it could be years. No pressure. In the last 8 weeks, Iï¿½d suffered 2 critical injuries. With 8 weeks left in camp, I popped out a rib trying to sweep Rodrigo. I should have known better. That injury took 6 weeks to heal. I couldnï¿½t step on the mats until 2 weeks prior to the tournament. That gave me a few days of sparring before leaving for South America. But on the day we flew into Rio, Rodrigo says, ï¿½letï¿½s go train! I want to show everyone at Humaita (Rodrigoï¿½s old school) what we can doï¿½. Sure enough, we beat everyone we come across in the room. Rolling with one of the black belts and trying to pass guard, I push off the mats and my knee buckles sideways. I know right away itï¿½s a serious sprain. Thatï¿½s 6-8 weeks of healing time. I have 3 days. I had always dreamed of quitting my job and only training Jiu Jitsu. Who wouldnï¿½t love to make their hobby into their job? The way to do that was to have my own school. The path wasnï¿½t direct. 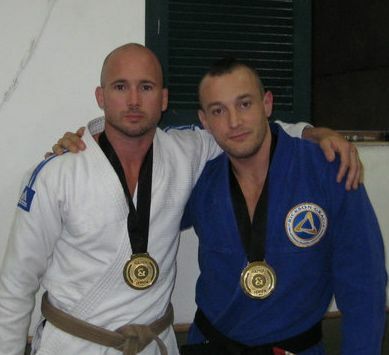 I started in 1998 and after 3 years of training with Rodrigo I had a purple belt. Iï¿½d taken 2nd at the Pan Ams as a blue belt and was undefeated in 8 MMA fights. But on top of 5 hours a day of training, I had a 40 hour a week job as an engineer. I was burned out. Realizing it would be another 5-8 years of continuous burnout training to receive my black belt and having a frank discussion with myself about my chances of becoming the UFC champion, I quit training to get my Masters in Business. The MBA had been a goal of mine since graduating from engineering school in 1996. After starting up my own engineering firm in 2004, I began personal training on the side to make money as the firm grew. Manufacturing in St. Louis was declining since the 1970ï¿½s and starting a manufacturerï¿½s rep firm was an uphill battle. I needed income and personal training was fun. By 2005, I was in phenomenal shape because I lived and worked in the gym. I wanted to come out of retirement and do 1 more Jiu Jitsu tournament, The Relson Gracie Nationals at the Arnold Schwarzenegger Classic in Columbus, OH. After winning all 7 matches and not being scored on, I was invited by Relson Gracie to his pro tournament in early 2006. Relson came up to me as I sat next to Rodrigo and said, ï¿½you are awesomeï¿½. I couldnï¿½t believe what an amazing compliment Iï¿½d just received from a God of Jiu Jitsu. These words inspired me to finish my training and get my black belt. In order to become a black belt under Rodrigo Vaghi, you must be one of the best in the world. Rodrigo is a black belt under Rickson Gracie, champion of the family. Achieving black belt would require complete dedication and this is why I started North Broadway Jiu Jitsu. Once I built up clientele, I would have all the time to dedicate to the training to get the coveted black belt. The first year, 2006, was dedicated to my students. As with any new business, you get out what you put in. One year after opening, I produced 2 novice division world champions. After this step, it was time to get back to work on getting the black belt. In the fall of 2007, I took 2nd at the no-gi world championships as a purple belt, losing to Kayron Gracie, 6-4 in the finals. After this, I received my brown belt. 2009 was going to be my year! The gym had built up and I could take time for myself to train. I was going to dedicate my life to training, win the worlds at brown belt and get my black belt. Fate had other plans. I was approached by my former boss and entrepreneur, Chad Remley, about a project. He saw how well I organized the Battle on Broadway and had plans for an MMA fitness training system. As the saying goes, ï¿½no good deed goes unpunishedï¿½. He would fund the project and I would direct the video. How could I say no? The payoff could be huge. I accepted his challenge and put together a phenomenal workout video and website, Fight Fit TV. Our website had members from 25 countries actively working out with us at the peak. We were the first to market. After we produced our video, others followed; Tapout, Georges St. Pierre, UFC, Bas Rutten, Century, Matt Hughes, Randy Couture and many others got into the market with MMA fitness systems and videos. All after us! We made our release around Christmas in 2009 and still sell DVDs on amazon. 2010 is mine to train. No more interruptions. I have so much knowledge about Jiu Jitsu, Judo, wrestling, fitness, strategy, and gamesmanship and itï¿½s time to put it to work. I have 6 months until the worlds in July and all the time to train that I need. I have all the right training partners. Rodrigo is training again and wants to go win the worlds at black belt. All the stars are aligned, itï¿½s time to go and get it. In addition to Rodrigo, I have Mike Rogers, Todd Fox, Jon Menke, Jon Thomas, Lance Benoist and Ryan Luna as well as all the guys at Team Vaghi and North Broadway Jiu Jitsu. My camp started slow as it should but by 3 months I was hitting on 8 cylinders and my game was sharper than ever. I was as lean as Iï¿½d ever been, my knowledge level was high, my diet perfect and my gas tank full all the time. With 8 weeks to go, I popped my rib out trying to sweep Rodrigo. I should have known better. I screamed when it happened and knew right away it was out. I laid my back flat and and with an intense pain it popped back in. Soft tissue takes 6-8 weeks to heal. The world championships was 8 weeks away. At least I knew if I wasnï¿½t sparring I couldnï¿½t hurt anything else, or so I thought. I looked at the bright side. Since I couldnï¿½t step on the mats until 2 weeks out, I would double up on the cardio. My runs were insane! I was hitting better times then I did when I wrestled in college. I was still planning on winning. As soon as we flew into Brazil, Rodrigo wanted to go to his old school, Gracie Humaita, and train. Personally, I would rather just break a sweat and not roll because whenever I roll with new people, I go hard because I donï¿½t want to look bad. And then it happened. Rolling with a black belt at Humaita and holding my own, I pushed off my knee and it buckled. The mats at Humaita were older and very smooth. Pushing off the side of my foot I usually get some traction but I had none and when my foot slipped all the pressure went on my knee sideways and it buckled. I crawled over to Rodrigo and said, ï¿½I hurt my knee badï¿½. I sat out and sadly watched the rest of the practice. I donï¿½t remember thinking anything. I think I was in shock or denial and felt really stupid for sparring when I knew to rest. Iï¿½ve hurt my knee enough over the years to know when itï¿½s not good. I had 3 knee surgeries while wrestling in college. Over the years Iï¿½d gotten really good at understanding the healing times for soft tissue. This was a serious sprain. 6-8 weeks just like the rib. I had 3 days. I called home and could hardly say what happened. I was so upset. I didnï¿½t know if I would be able to compete. If the competition were today, I would say no. Rodrigo and I practiced taping my knee a couple times with kinesio-tape. We would tape it, I would walk around and see how it felt. That was all we had. When I walked down the streets of Rio and turned a corner, my foot wouldnï¿½t move with my hip and knee. I had to physically hold my knee joint and turn my leg slowly to avoid leaving my foot behind. After 2 days it was still bad but my only choice is the kinesio-tape. Iï¿½m not going home without competing. Iï¿½m already here. We will see how good I really am. I keep having conversations with myself. My opponent does this and I do that and so on. My thoughts are about how to protect my knee. I think that if Iï¿½m ahead on points in all the matches, I can slow the match down and avoid scrambles to protect the knee from buckling. Itï¿½s game day. Iï¿½m sitting with my back against the wall in the open air stadium with Rodrigo standing guard over me. The birds are flying back and forth. I have 30 minutes. In the rush to get to the stadium on time, Rodrigo and I forget to wrap my knee. I donï¿½t realize this until after the tournament. All I can think about is to win and get this done so I donï¿½t have to do this again. I have the long draw in the tournament. This means if I win my first match, I go against an opponent who hasnï¿½t yet competed. Oh well, nobody can say I didnï¿½t earn the championship. I donï¿½t care. My focus is on the first opponent. If I canï¿½t get past him, I wonï¿½t have a chance at the second guy. Iï¿½ve already developed my strategy and it is diversity. Competing as a younger man, I would stick with one major game plan and hit only that move or series of moves at each tournament. The downside to this strategy is that as you go through the tournament, your next opponent is always watching you. Today, I will be diverse and alternate strategies in each match. This strategy requires you to be equally good at everything, which I am. Rodrigo forced me to be good at everything as he promoted me. My game could be complete in 9 out of 10 ways but Rodrigo would wait 2 years for that last part of my game to develop before promoting me to the next belt. Some call it sandbagging. We call it excellence and we donï¿½t apologize for it. I executed the plan perfectly. I pulled guard and won 12-0 in my first match. The second match was my closest because I went against a fresh opponent and my knee buckled once. I won 3-0 with a guard pass. In the semi-finals I defeated the Brazilian national champion 6-2 and in the finals I went down 0-2 and came back to win 9-2 and had my opponent in a deep choke when the bell rang. I am the World Champion. When I was a kid I would watch olympic wrestling. On the awards stands, sometimes the champion wouldnï¿½t smile. I couldnï¿½t imagine this because this was a dream of mine to stand on top of that podium. After reaching the pinnacle of my sport, I was thrilled and all smiles. By the next day I was drained and I didnï¿½t feel like smiling. I was tired mentally and physically. This picture of Rodrigo and I sums it up best. I received my black belt 2 months later. It had been the most rewarding and emotional tournament and training camp in my life. It was my last.